You are going on a long awaited camping trip. One of the basic essentials would be a good camping tent. You want a tent that can withstand the elements, the unexpected strong wind and thunderstorm, a waterproof camping tent with weather-resistance fabric. 1) A waterproof camping tent that does not leak water as well as having waterproof floor covering. A rain fly over the tent is a great add-on to give additional protection from the rain or heat. 2) A bathtub style flooring is best as the seams stretch a short distance right up the sides of the tent wall thus very much reducing the chances of water sipping in from the ground. Placing a tarp underneath the floor covering gives additional protection from water leakage as well as the rough ground surface that might have protruding sticks or rocks. 3) Ensure that the seams are factory sealed for maximum rain protection. Additional protection by seam sealing your tent before your first use. 4) Enough inside space to move around and sleep comfortably. A tent whereby you can stand upright would be a plus point. Changing clothes in a crouching position is no fun. Do take note that when the tent is designed for 2, 4 , 8 etc. person, it means exactly that with no extra space for your camping gear. 5) A rectangular shaped floor makes it easier to position sleeping bags or mattresses. 6) Divider wall with zipper provides privacy when needed. It would be even better if removable to create a big open space. 7) Mesh side pockets or hang loops offer much needed storage space for camping gear and a hanging lantern or light. If you need more storage space, then you can consider buying a gear loft which is cheap. 8) Bug-proof mesh covering over windows, doors or roof openings improve air circulation as well as minimize condensation, besides blocking out unwanted ‘visitors’. A mesh covered roof opening offers a lovely magical starry sky view as you sleep. 9) Ability to roll-up mesh covering of windows would be a nice feature for air circulation and temperature control. 10) A tent with vestibules is a great option as it provides more space for your muddy shoes/boots and gear. The vestibule is also a great space for your dog to sleep. 11) Tent poles used to be fiberglass materials but these poles are heavier and tend to break easier when compared to the stronger aluminum poles. Nowadays, fiberglass poles are used in cheaper tents. 12) Easy to set up and take down. Shock corded and color coded tent poles makes it easier to pitch the tent. Shock corded poles refer to poles that are divided into a few sections and joined together with these elastic short cords. Instant tents such as the Coleman instant tent takes setting up tent to a simpler and faster level. They come with the whole pole system attached to the tents. A large family camping tent is essential if going with family members or a group of friends. Comfort is important with weight being secondary as you do not have to hike or trek far to set up camp, unlike the lightweight backpacking tents for a hiking holiday. Large family camping tents are more suitable for car camping at campsites. Large family camping tents are normally dome shaped tents and cabin style tents. Cabin tents offer a more spacious interior due to its almost vertical walls whereas dome tents come with sloping walls with the tallest height at the center. However, cabin style tents are heavier and bigger in size. Dome shape tents with lots more crisscross poles for support can withstand better when it comes to strong winds and ferocious storms. 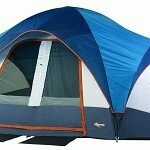 Some tents will be more durable than other models. High end camping tents such as the Tentipi Nordic Adventure tents are ultra lightweight yet strong, waterproof and condensation proof tent fabric, lightweight floor fabric made specifically to resist wear and penetration with a relatively thick polyurethane coating. The Tentipi Nordic Adventure tents come with limited lifetime warranty. 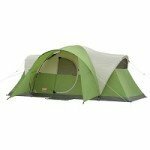 Instant tents such as the Cole Instant Montana Tent can be set up in just a minute. This is due to the pole system that comes pre-attached to the tent. Dome tents can be setup with minimum fuss. Normally these come with 2 or 3 shock corded tent poles which are packed in shorter sections joined together by the elastic cord. The short sections are snap into place to make a long pole when setting up the tent. 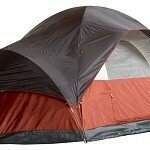 Center height : 6' 6"
Tent Floor - 120 Gram Polyethylene 196.85" x 185.04"
Center height : 6' 2"
Luxuries of space, standing height, outstanding ventilation and an open fire or a stove. Lightweight ripstop polyamide fabric. 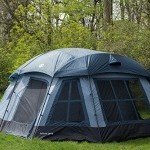 Modified dome shaped tent, the Coleman Montana 8 tent is designed to sleep 8 people. However, there won’t be much space to move around if all 8 are adults. With a center height of 6 feet 2 inches, standing upright is possible with most campers. A single room tent with a 16 by 7 feet footprint, the Montana 8 tent comes with Coleman WeatherTec system with its special waterproof design. It is a spacious tent with plenty of standing and walking space. It is easy to set up. It comes with shock corded fiberglass poles and color coded snag-free continuous pole sleeves with InstaClip pole attachments. With 2 person, tent can be set up in under 20 minutes. Factory sealed fly seams to ensure your tent stays dry. Rugged bathtub style polyethylene flooring with seams raised above the ground minimizes water leaking in. The hinged door makes it hassle-free for going in and out of the tent especially with kids running around. At night, youcan zip it shut if you wish. Comes with velcro fastening too. Optimal ventilation is achieved through its mesh roof and 2 side windows. The windows are specially angled in such a way that allows light to enter but not the rain water. Windows can be zipped up too. The front porch is a convenient place for your dirty boots and shoes. With the detachable rainfly extending beyond the front door, your shoes and gear will be kept dry. There is even a polyethylene door mat provided. Rainfly can be easily attached to frame using hassle-free velcro attachments. 2 interior zipper side pockets provide a space for your bits and pieces. It comes with an electrical access port for your convenience. Most consumers commented on its ability to withstand strong winds and heavy rain, keeping the interior dry. Very spacious with 2 queen size air mattresses and still plenty of room for gear and dog is another common feedback. Satisfied customers commented on the easy set up. Windows are a bit high. When the weather is warm and humid, the gentle breeze doesn’t cools down the lower part of the tent. If you wish to have the convenience of LED 3 settings light (high, low and nightlight) and roll-up windows, then you can check out the elite Montana 8 tent. 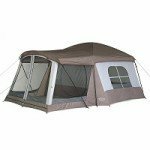 It has exactly the same features as the Montana 8 tent except for the light and roll-up windows design. Measuring 17 by 10 feet with a center height of 72 inches, it is fitted with Coleman’s exclusive Weathertec System. This means leak-free protected seams, weather-resistant fabric, waterproof floors, zipper protection, and a wind-strong frame; all contributing to a happy camping holiday even under harsh windy or heavy rain conditions. Leak-free protected seams – Rainfly seams come fully taped and cover all doors and windows. Zipper guard zipper cuff at D style front door keeps out the water. Stitches are not exposed. Water-resistance fabric – Heavy-duty taffeta walls with polyurethane weatherproof coating together with anti-wicking thread. Tub Style Floor – Comes fitted with tub style floor with welded corners and inverted floor seams. A bathtub style floor is the best type of flooring to prevent water leakage. It is designed in such a way that the floor edges goes a few inches up sides the walls before joining to the wall fabric. With no seams on ground level, this eliminates the possibility of water leaking inside the tent. Inverted floor seams hide needle holes from the elements, an additional water-resistance feature. Wind-strong Frame – 4 shock-corded poles and guy-out triangles plus frame clips to anchor tent into a more wind-responsive frame. 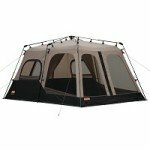 This 8 person family camping tent comes with removable wall dividers to create 2 -3 separate rooms if needed. It is very spacious and with 6 feet center height, most people can easily walk around inside in the more comfortable upright position. However, if you intent to put in queen size mattresses, most probably can only fit maximum 3. It will be better with sleeping bags. Setting up is easy with its color coded shock-corded poles and steel tent stakes, 4 poles for tent and 2 for rainfly. To make it even more easy to set up, simple instructions are sewn onto the storage bag. You are given separate bags for storing the tent, poles and stakes. With a mesh covered roof, you can remove the rainfly on a hot and dry night for better air circulation with the side benefit of a romantic starry sky view, without the bugs! 2 side windows and a back window with mesh covering together with the mesh covered roof, give a great air flow and optimum ventilation system. 2 side wall pockets are available to keep your camping stuff. The Best 5 Winter Boots Reviews – Choose The Perfect Boots For This Season! Outdoor Exercise Ideas Copyright © 2019.